There are just 5 ingredients in these Zucchini Fritters with Feta Cheese. It’s an easy, healthy recipe that’s ready in under 30 minutes! I’ve never met a zucchini recipe that I didn’t love from Zucchini Noodle Alfredo to Zucchini Bruschetta. But, I’m particularly partial to the Greek-inspired combination of feta cheese and red onion that we also used in Zucchini Egg Muffins. This recipe has been in the works for weeks. But, every time I make these tasty little zucchini cakes, they’re gone before I have the picture. These cakes are chock full of zucchini shreds, diced red onion, and crumbled feta cheese and a slight aroma of their savory goodness lingers in the air when you make them! It’s all about the shreds! Use a grater to make coarse shreds. But, don’t stop there. Get rid of the wetness. Spread the shreds out on a towel, top with another towel and press out the excess liquid. Secondly, handle the delicate zucchini fritters with care. Compress them tightly with your hands into small, slightly rounded balls. (When you drop them in the pan, they will flatten.) Small cakes are easier to work with. These are each about 1/4 cup of the mixture that has been tightly compressed. If you have time, refrigerate the patties for a half hour in the refrigerator. Coat the bottom of the frying pan with a very thin layer of olive oil. 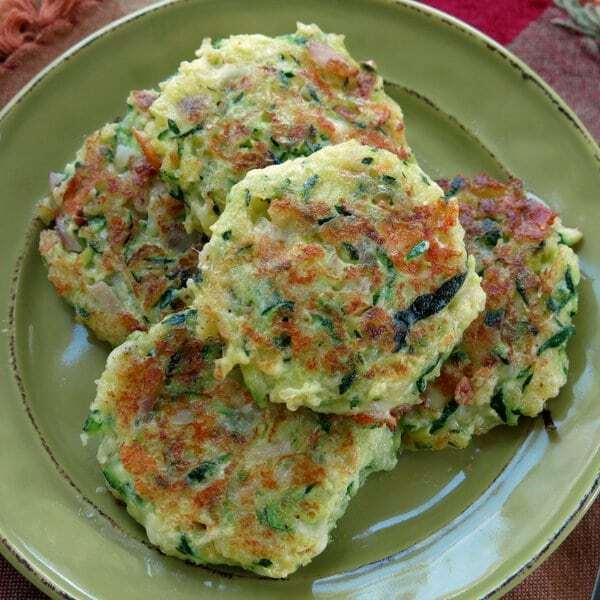 If you use too much, the zucchini fritters will absorb the oil and become excessively soft and difficult to work with. Cook the zucchini fritters for about 2 minutes on each side. Try not to flip them too much. (Did I mention they are delicate?!) They will be browned on the outside. If they seem to be spreading too much, push the sides back in with the spatula. Remove cakes to a plate lined with paper towels (to absorb any excess oil.) They will firm up a bit as they cool. Ahem…if you actually do wait for about 5 minutes. Variation: Substitute carrot shreds for some of the zucchini shreds. The final result is a little zucchini fritter or cake or patty. Call it what you like. It’s a savory appetizer or put it on a bun and you’ve got a meatless slider. These are awesome with a little sauce on top too. Check out this Homemade Tzatziki Sauce by Joy Food Sunshine. There are just 5 ingredients in Zucchini Fritters with Feta Cheese and they're ready in less than 30 minutes! 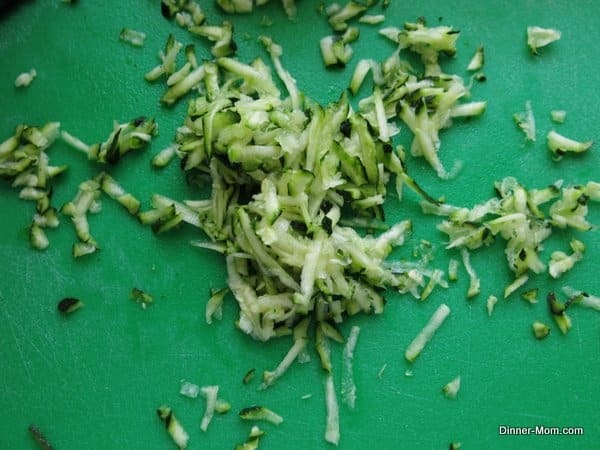 Spread zucchini shreds out on a towel. Place a towel over the top of the shreds and press out excess water. Add zucchini, red onion, feta cheese and panko bread crumbs to a bowl and stir to combine. Compress about 1/4 cup of the zucchini mixture into a small patty. Spread a thin layer of olive oil in the bottom of a frying pan over medium heat. 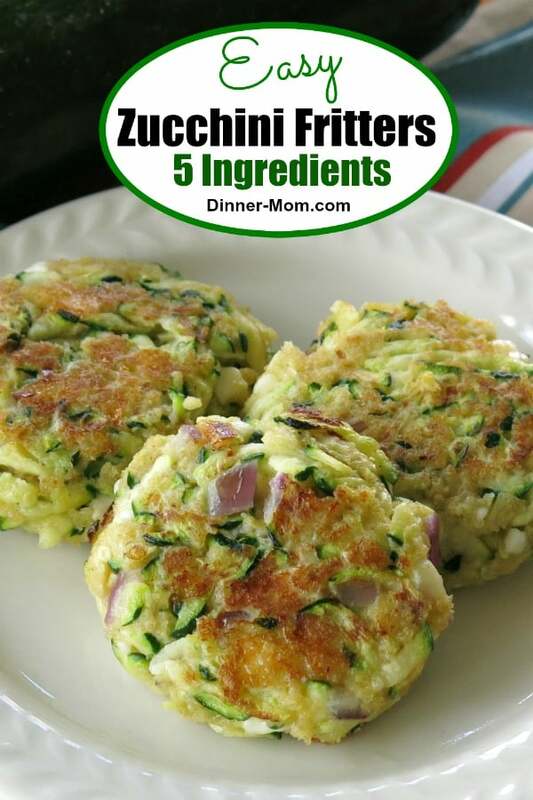 Add zucchini patties to pan and cook for about 2 minutes on each side. The patties are very delicate. Try to turn only once. Remove to a paper plate lined with paper towels and cool for about 5-7 minutes. Cakes will firm-up more as they cool. It’s been a long time since I’ve made these. Yours are really tempting me to cook them soon!! Yum! 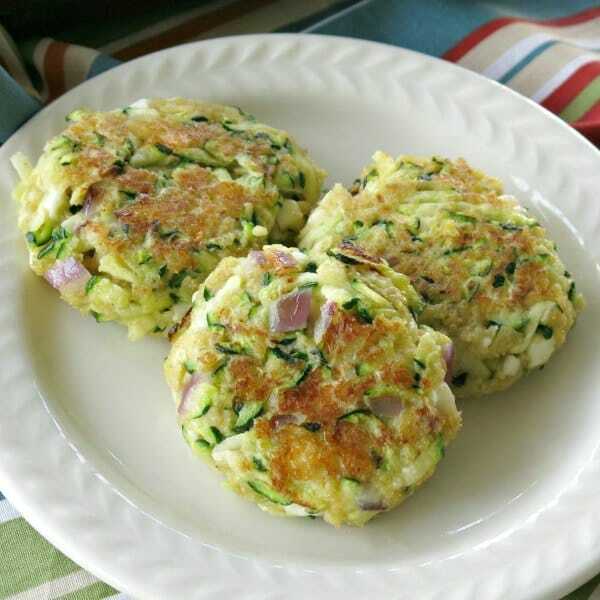 These are similar to some zucchini latkes I make (minus the potatoes) – love these. I could easily eat all 14. These look amazing! I am obsessed with anything zucchini or anything I can use my Spiralizer for! Yum! oh, and the feta cheese is a perfect addition to these! I love zucchini cakes and these look so delicious! Easy, nutritious and delicious…my kind of recipe! Thanks! I’ve never made zucchini cakes. My husband’s grandma used to make them all the time. Yours look awesome! OMgoodnness these zucchini feta ‘latkes’ as we call them look fabulous! Just mouthwatering! Bookmarking to make– I love zucchini 🙂 It looks similar to my zucchini tots. Great twist on a zucchini fritter! Thanks so much!!! I’m always looking for new ways to use up my zucchini. This looks great! These look fabulous! Such great tips on achieving the perfect zucchini cake! And pairing it with feta and red onion – Oh, yum!! Recipe states”Move to paper plate lines with paper towels and continue cooking additional 5-15 min. Cook on paper plate???Huh? Oh read again. . . .you meant COOL 5-7 min. Hi! Thanks for your comment! Should be “cool” for 5 minutes! The Zucchini cake looks pretty good and delicious, will try it. I hope it comes out good and taste good as it looks. I don’t understand the nutrional info! How many patties are a serving? I’m trying to log my food and these were delicious but I don’t know if I’m correctly logging these patties. Is it 179cal for one patty? Again, these were fabulous and delicious! Hi! I’m so glad you enjoyed them!!! We did not calculate it per cake because everyone seems to make them a different size. Take the total amount of cakes that you made and divide the total by 4. If the yield was 8 cakes, then 2 would be a serving. I hope that makes sense and sorry for any confusion!!! These are delicious! I didn’t have red onion and so I substituted yellow onion. Still excellent. The flavor of the feta cheese really shines through. I’m so glad you enjoyed them! They are great with green onion too! Hi could these be done with chickpea flour or coconut or ground flaxseeds flour instead of panko bread crumbs? Absolutely! I haven’t tried those, but have been experimenting with different fillers (so far, some low-carb crackers.) I’d love to know how they turn out. I have made it today for our dinner, my husband and I really like it, the taste of the feta cheese with the Zucchini made a so delicious Cakes. 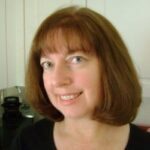 Also the recipe is so easy to follow, and the cooking time is so fast…Thank you for sharing it Marjory! I’m so glad you enjoyed it! Thanks so much for commenting…made my day! Absolutely wonderful. I made these little goodies for lunch today! They were easy to put together and cook. I had all the ingredients on hand too. I’m always looking for quick and easy zucchini recipes and this fits the bill perfectly. Thank you for the recipe. This is a keeper. These are delicious! Sub’d Vadalhia onions for red onion and added a little shredded red bell pepper. Will be making again soon! Such a great recipe. Thank you for sharing. I let them cook 4 min. per side on med. heat to get a nice brown crust. They taste very good. I bet you could substitute parmesan cheese and white onion too if you didn’t have the other ingredients. Thanks for your comment! And, yes…Parmesan cheese and white onion would be delicious too…especially for Parm fans like me! That should work perfectly!!! I hope you enjoy them! I eat a cheese free diet. Would there be any substitution for the cheese that you can think of? Hi! I haven’t tried a substitution in this recipe. There are some vegan cheese substitutes that should work. Or, you might consider trying corn kernels and adding a pinch of garlic powder to replace the zing that feta often provides. Let us know how it works out if you make it!